I HAVE OBSERVED that Soccertalk readers seem to be loving the historical theme in my analysis of Nigeria’s 2018 FIFA World Cup qualifying campaign and I have decided to stick to it. For older readers, obviously it brings lots of nostalgia and for younger readers, it brings knowledge and insight. So, why change a winning theme? That headline had been inspired by a photograph of Austin Jay-Jay Okocha celebrating his wonderful free kick goal against Algeria (which tied the match 1-1) by pointing his index finger towards the heavens. That is a gesture used by Muslims to signify the oneness and greatness of God and I was pleasantly surprised when my boss, Dr. Sunny Obazu-Ojeagbase and my colleague, Samm Audu, both Christians, were embraced the creativity behind the headline and fully endorsed its use on the cover of Complete Football magazine! In fact, it was Samm’s idea to also add the Arabic lettering of “Allahu Akbar” which I did. Indeed, when the magazine hit the newsstands, it sold out. We didn’t receive any complaints from any non-muslims about our choice of language. Everybody was just excited that the Eagles were “Back On Course” for USA ’94 after losing their previous game 2-1 to Cote d’Ivoire in Abidjan. Football, indeed, is a big unifier in Nigeria. The Eagles would go on to qualify for USA ’94 by holding Algeria to a 1-1 draw away in their last game of the qualifying series. Nigerians expect a similar outcome when the race for Russia 2018 is concluded in 2017. The Eagles last game in this series again will be away to Algeria but my expectation is that the World Cup ticket will already be in our pocket before that game is played. Last Saturday at the magnificent Godswill Akpabio Stadium in Uyo, Akwa Ibom State, the Eagles fulfilled my audacious prediction in this column by beating highly-rated Algeria and staying “On Course” for the ticket to Russia. Following the opening day 2-1 victory away to Zambia, Nigeria now have the maximum six points and are the favourites now to qualify from the African group “B”. Considering that football is so unpredictable, quite a number of people have asked what gave me the confidence to stick my neck out so foolishly for the Eagles in such a high profile match against such an accomplished opposition. I will say the truth: The analytical reasoning behind my prediction was very little. For the most part, it was a blind faith in God that made me stick my neck out! And that is why my headline today is one of gratitude to the Supreme Being. Alhamdulillah Robil Aalamen (Thanks to God, the Lord of the Worlds). Tactics: Compared with his starting line-up in the last game against Zambia, there weren’t many surprises in Gernot Rohr’s team selection against Algeria. That means the core of a new Super Eagles is beginning to emerge. Goalkeeper Daniel Akpeyi’s selection was forced by Carl Ikeme’s absence through injury; Leon Balogun and Victor Moses’ return to the starting line-up were expected; and the introduction of Oghenekaro Etebo in midfield was advocated by this column so there were no surprises there. What Rohr did differently was, rather than play Etebo as an attacking midfielder, he deployed him in a defensive role alongside Ogenyi Onazi and pushed captain Mikel Obi forward into the attacking midfielder role. 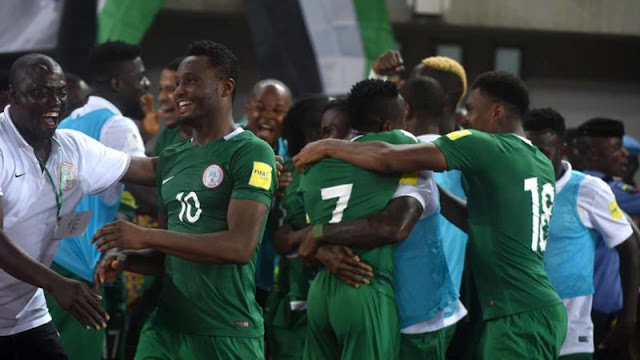 That little tweak turned out to be very significant because Etebo did a marvelous job of breaking down the Algerian play while Mikel assisted one goal and scored another from his advanced position. There was also a little surprise in the front line where Rohr fielded Kelechi Iheanacho as the central striker with Moses and Alex Iwobi on the flanks. I had expected either Odion Ighalo or Brown Ideye to start as the main striker supported by Moses and Iheanacho. By starting Iheanacho and Iwobi together, Rohr clearly went for skill and flair in attack rather than the power that Ighalo or Ideye would have provided. The Eagles got away with it because of Algeria’s style of play which is more technical than physical. Against a physical side like Cameroun, I’m not sure how effective the delicate Iheanacho/Iwobi partnership will be. But there will be enough time for a further test of that. Moses, meanwhile, provided the skill, power and pace to decimate the Algerian defence. His two goals were ample evidence of his effectiveness. Tactically and technically, I would say that the match suited Moses’ style perfectly. It was set up for him to shine. Finally, Rohr got his substitutions spot on. With the score at 2-1 and Algeria pushing for an equalizer, bringing Wilfred Ndidi into midfield in place of the tiring Mikel halted the Algerian advance, while a fresh Ahmed Musa was just too fast for the tired legs in the Algerian defence. It was no surprise that Musa’s speed created the third goal for Moses and there could have been more as the Eagles switched fully into counter-attacking mode. Overall, it was a good tactical performance by Rohr, but I think playing Etebo in defensive midfield was the masterstroke. I will score the Eagles eight from 10 marks for tactics. Team Work: There has been great improvement in Nigeria’s team play since Rohr took over and it showed again against Algeria. 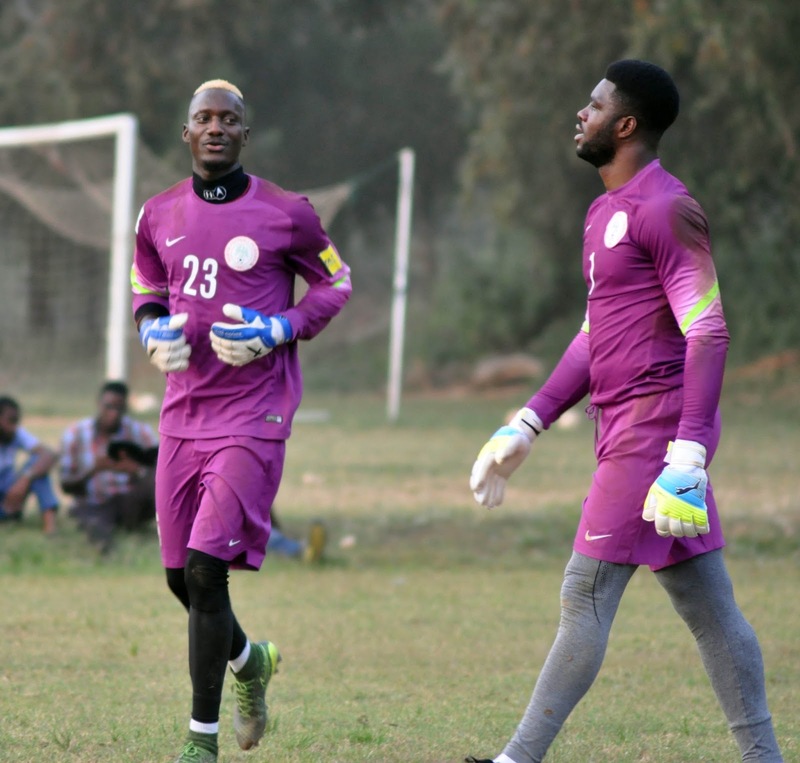 Before the match, there was trepidation over goalkeeper Carl Ikeme’s absence because he had been the Eagles’ savior against Zambia and everybody was fearful about Daniel Akpeyi’s capabilities. It turned out that Akpeyi didn’t need to perform any heroics against Algeria because, for most of the game he was well protected by his defence line. 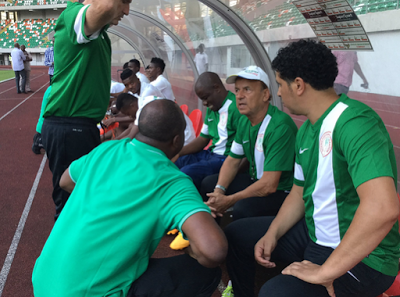 Leon Balogun and William Troost-Ekong showed great understanding in central defence while full backs Elderson Echiejile and Kenneth Omeruo did a better job than the Zambia game. The only goal scored by Algeria could have beaten any goalkeeper. 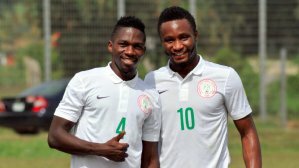 In defensive midfield, Etebo’s outstanding performance also brought out the best in Onazi who didn’t have to over-work himself this time around like it often happened when he was paired in that role with Mikel. Up front, the frequent interchange of positions by Iheanacho, Iwobi and Moses signaled great cohesion among the players and that can only benefit the team. I will score the Eagles another eight from 10 marks for team work. Concentration: This, in my opinion, was Nigeria’s weak point against Algeria. At 1-0 up, the Eagles nearly conceded a quick equalizer when they surrendered possession in midfield and Algeria counter-attacked swiftly. 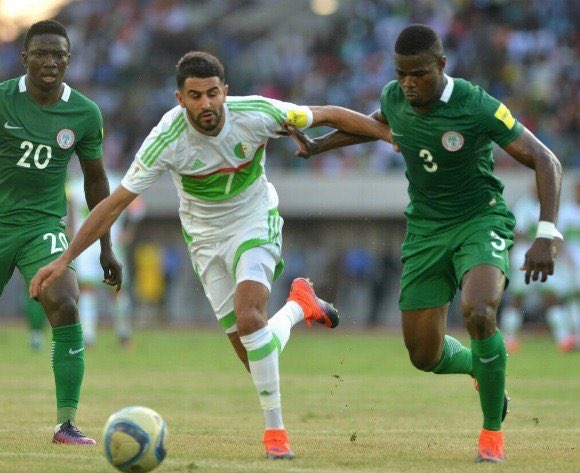 It was only by divine favour that the Algerian striker lifted the ball over the bar with Akpeyi already beaten. In the second half, Algeria finally scored with a 30-yard shot when the Nigeria defence gave the scorer too much time and space to shot. I didn’t want to be too hard on the Eagles for conceding that goal because, we all knew before the game that Algeria were a quality side with quality strikers capable of scoring fantastic goals. But a bit more concentration by the Eagles would have averted the goal. That said, the Eagles level of concentration was actually better in comparative terms because this has been Nigeria’s archilles heel in international football. North African and European opponents are always on the look-out for those slips in concentration because of their proven belief that black African players, though skillful and strong, lacked the mental strength and professional discipline to concentrate for the full 90 minutes of a football game without making costly blunders. Therefore, their strategy usually is to wait patiently, knowing that the average black African defender would lose focus at some point and surrender possession carelessly in a dangerous area. North African clubsides, in particular, have seized on this weakness to punish Nigerian clubsides in African competitions for decades and that is why I expressed concern some weeks back about fielding home-based Nigerian league players in the Eagles defence for our World Cup qualifiers. I have lots of respect for our league players because of the odds that they have deal with. But they have not found a solution to their habitual slips in concentration and generally poor tactical discipline. These failings will continue to deny many of them of opportunities in the Super Eagles even under Gernot Rohr. I score the Eagles six from 10 marks for concentration against Algeria. I hope Rohr can infuse his German discipline into our defence ahead of the remaining World Cup qualifiers. The Eagles will become impenetrable and nearly unbeatable like the German national team. 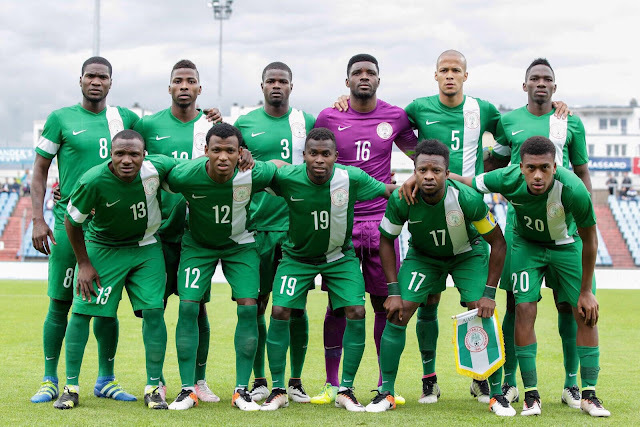 Determination: I will score the Eagles 10 from 10 marks for determination against Algeria. Last week, I predicted that “Super Eagles Will Win” only if the players wanted it as much as I did. From their performance, it was clear that they wanted the win so badly and they were ready to work for it. The players’ determination made up for their short-comings in other areas. And with a vociferous home support provided by the fans at the Nest of Champions stadium cheering them on, the Algerians stood no chance. I conclude by thanking God again for crowning the Eagles efforts with success. Two games, six maximum points and we are firmly on course for the 2018 FIFA World Cup finals. Will Nigeria Land in Russia? • AFTER the final whistle on Saturday, I received a message on Twitter pleading with me to predict that Nigeria “WILL” qualify for the FIFA World Cup finals in Russia 2018. The sender believed that if I made that prediction now, it will come to pass. It is premature to make a call on who will win our group ticket. What is clear for now is that the Eagles have replaced Algeria as group favourites and that comes with its own additional pressure. How Nigeria copes with that pressure will be decisive. The Eagles have momentum on their side now and they would benefitted from it had their next game against Cameroun been coming up soon enough. But that match will not be played until August 2017 which is a massive nine months away. A lot can happen to change the dynamics of the group before then. Algeria and/or Cameroun could become a completely different prospect if they discover something special while preparing and participating in the 2017 AFCON which Nigeria, unfortunately, will miss. I remember an interview given by the Cameroun coach to the 2000 AFCON which they won in Lagos. He confessed that they “stumbled” on the 3-5-2 formation that won them the trophy by accident while trying out different systems in a closed camp. Nigeria cannot benefit from the team-bonding, tactical adventures and greater understanding that long campings would engender in the teams going for AFCON 2017. But we will be able to spy on our opponents. Rohr must take full advantage of that. At the start of the World Cup qualifiers, I set a target of nine points from the first three games and 13 points overall for the Eagles to get to Russia. If they can achieve the first target by beating Cameroun in our next home game, the path to the second target will become clearer. Until then, no further predictions from me! • Alhaji Alao, even after reading your effort to deflect full responsibility for your declaration that “Super Eagles Will Win” against Algeria, I still wonder why you are sticking out your neck. I like your boldness though. Your stand on this game will embolden me to watch it live as I had planned not to (I love my heart) before I read your piece. – Howard Odigie, Lagos. • How time flies Mumini. The 1994 World Cup qualifier between Nigeria and Algeria in Lagos seems like it was played yesterday. Jay-Jay Okocha in that match was mesmerizing and magical. To an Algerian defender sitting on the bench, the ball was tied at Okocha’s leg. Victor Moses will play that role for us on Saturday. Conversely, however, my crystal ball is showing a very tight game. But Nigeria eventually triumphs courtesy of Victor Moses ingenuity. Two weeks ago, my name was inadvertently spelt Omolaja instead of Omojola. Please take note – Omojola Igbekele, Ikorodu. • I read your article on Super Eagles and Algeria previous engagements and the results which is in Nigeria’s favour. I really appreciate your in-depth knowledge of African Soccer History and accurate match results. By the grace of God we shall win this encounter by two goals. Just advise our coach to beef up the defence and substitute tired players. – Tunde Johnson. • THE SONG “We Will Win”, let’s join the chorus. Let’s shout it to the high heavens. We’ve got the colour, we’ve got the strength, will, determination and focus. We’ve got the pace, skill, brain, manager and fan. We are ready. We can fly, we will soar, and we will win. We are the Nigerian Super Eagles!!! Yes, Amen, I concur! Super Eagles will win! Not just because you want it, we all want it. We have the talent to win it and we are the host. I consider winning in Uyo as a ticket to Russia. – J.D Korode, Ijagbo, Kwara State. • Dear Alhaji, the Nigeria/Algeria match of 12th November will be their 19th confrontation because they both met at the 1978 AAG soccer final in Algiers on the 28/7/78 and Algeria won by a lone goal. Please note that it was Toyin Ayinla’s own-goal that settled the 1986 FA Final. *Thank you for your observation. • Sir, I am a big supporter of the Super Eagles. I was at the National Stadium Surulere in 1981 when Nigeria lost 0-2 to Algeria in a 1982 World Cup qualifier. I remember that our team wore white jerseys instead of our favourite green and I told my friend that Nigeria may lose the match and they did. This Saturday, history must not repeat itself. – Emmanuel Okonkwo , LAGBUS, Lagos. • Good morning, the analyst. I want to agree with you that Nigeria will beat Algeria because I see a lot of the new, young players and the older ones who want to make a name and play in the World Cup. Let’s win and qualify for Russia, Timaya sang. I concur with you, more grease to your elbow. • I watched some of these Algeria players and I believe that, with right mental and psychological attitude, Eagles will win. – Azudiaby, Ilorin. • You are not alone. I share your confidence and I believe we will overcome on Saturday by the Grace of God. #SOAR EAGLES. – Peter O. Savage, Lawanson, Lagos. • Asww Alhaji, you predicted that Super Eagles will win and we did win on Saturday. May Allah continue with to guide you sir. Thank you for supporting Nigeria. • Since Cameroun and Zambia played out a draw, Nigeria’s chances of qualifying for the World Cup is brighter with the win against Algeria. Eagles should keep their game going. I believe our qualification for the World Cup will not require any calculation. – Gordon Chika Nnorom. • Greetings sir. Trust you and dear ones are well. Great analysis as always. Good ibo language, tiny flaws. 100% for the attempt. Best wishes of more success to you and CCL team. – Igbogbahaka. • Sir, the statement “Ndi IfeanyiUba, Imeela” (you have done well) is incorrect; it should be “Ndi IfeanyiUba, unu agbaliala”. Thanks. – Emeka LSDPC Estate, Isolo. *I’m told that both statements mean the same. Daalu! (Thank you).